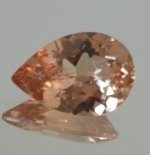 Topaz, Imperial pinkish orange, Brazil. 1.45 ct emerald cut, SI. 4.8x10.6 mm. #TZGE-0145. $50. Topaz, Imperial great pinkish orange, Brazil. 1.19 ct emerald cut, I. 4.3x8.7 mm. #TZGE-0119. $50. Topaz, Imperial pinkish orange, Brazil. 0.83 ct emerald cut, I. Great pinkish shade. 4.1x7.1 mm. TZGE-0083. $50. Topaz, Imperial pinkish orange, Brazil. 1.14 ct pear shape. 6x8.7 mm. SI, #TZGP-0114. $50. Topaz, Imperial pinkish orange, Brazil. Round, 0.62 ct., 5.35 mm. VSI. #TZGR-0062. $50. 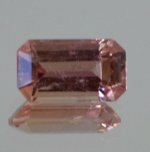 See other topazes listed under Colorado Gemstones, Topaz. Most of our current stock is Colorado topaz.